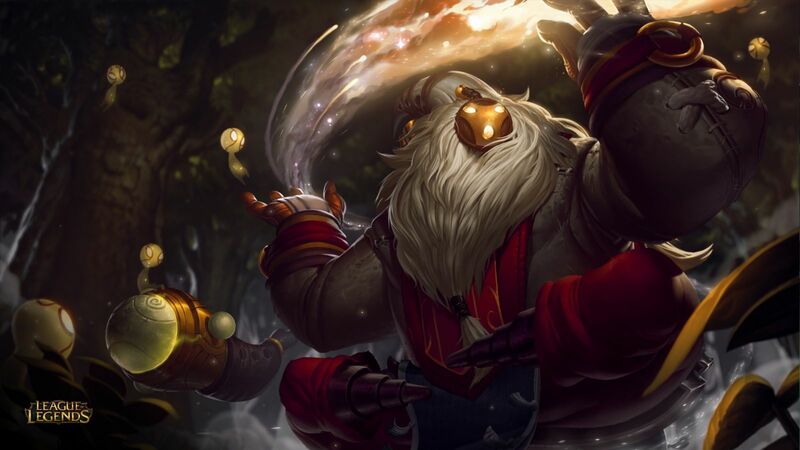 Riot Games has just announced their latest champion: Bard, the Wandering Caretaker. Bard is intended to fill the role of support. Movement will be the name of the game, as Bard will generate chimes across the map as he moves. Collecting these chimes will replenish Bard’s mana, give him experience, and a temporary speed boost. Bard also attracts little creatures called “Meeps”, that launch themselves at whoever Bard is attacking. The number of meeps that come to Bard’s aid tied to how many chimes he has collected. (Q) Cosmic Binding- Bard fires out a burst of spirit energy in a line, damaging and slowing the first enemy struck. After Cosmic Binding hits an enemy, the burst of energy continues through, searching for secondary targets. If it hits a wall, it stuns the initial target; if it hits a second enemy, it stuns both targets. (W) Caretaker’s Shrine- Bard conjures a health pack that gains power for a few seconds. Allied champions who walk over the pack gain health and a brief burst of movement speed, while enemies can stand on the pack for a moment to destroy it. (E) Magical Journey- Bard conjures a portal on a target wall. The portal tunnels through to the far end of the wall, granting one-way passage to all champions, friend and foe, who enter it. (R) Tempered Fate- After a brief delay, Bard places all units in a targeted area – friend or foe, including champions, minions, monsters and turrets – in stasis. Frozen units are immune to all damage until the effect wears off. Bard’s arsenal of abilities should make him a worthy support. No release date has been disclosed, but Bard’s price is expected to be 7800 IP, or 975 RP for 1 full week after release, like all new champions. After which, Bard’s price will drop down to 6300 IP.